Can Above Ground Pools Stay up Year Round? Posted on December 4, 2018 , in Above Ground Pools. Although outdoor pools are great for cooling off during a hot summer, what do you do with pools when the weather turns colder? A common question asked is, “Can above ground pools stay up year round?” And although the easy answer is that “Yes, they can,” whether you want to leave them up year-round really depends on the type of pool you have. Dismantling some above ground pools for the winter may be more hassle than it’s worth. Whereas other above ground pools are so easily dismantled, from a maintenance perspective it makes good sense to take them down for the winter. In this article, we’ll go over the two main types of above ground pools and comment on some of the maintenance issues. Ring pools are so named because of their shape and the fact that the main component is an inflatable ring that surrounds the top edge of the structure. As you fill the pool with water, the ring floats on the surface and eventually raises the pool walls up along with it. 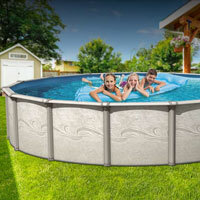 Ring pools are constructed of durable vinyl and are typically about 3 feet deep with a diameter of about 12 feet. For added stability, the ring itself is of a smaller diameter than the floor. Ring pools hold enough water (about 1400 gallons for a 12-foot diameter pool) to necessitate a filtration system and chlorine treatment program. However, ring pool installation is as simple as transporting it from the retail outlet, dropping it into place and filling it with water using your garden hose. As simple as they are to set up, ring pools are just as easy to dismantle for the winter. Ring pools are a good way to learn the basics of pool maintenance and see if investing in something more permanent is a feasible option. Frame pools are composed of a metal frame lined with a vinyl pool liner. They can be deeper than ring pools with standard depths of four to five feet. With a little extra landscaping work, frame pools can reach depths of six and a half feet. Frame pools can easily hold more than twice as much water as ring pools, however, they can still be filled with a garden hose. They will also require a filtration system and work well with pool heaters to keep the water temperature comfortable. Frame pools can be a lot larger than ring pools and take more effort to install or dismantle. Depending on the pool’s size, installation can take two to five days since there will be a need for some landscaping work and the laying of a sandy base. For this reason, many people choose to leave their frame pool up throughout the winter. This also allows for decking to be installed to surround the pool to make it look like a more permanent part of your backyard. Now that you know what conditions that above pools can stay up year round, download a buyer’s guide to learn more about our models.